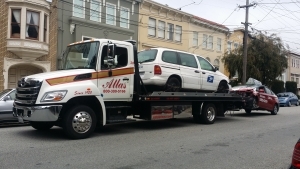 At Atlas Towing, our diverse towing capabilities and vast service options complement our extensive experience. We recognize that this industry requires an emergency-based mindset, where expedient service is necessary in resolving vehicle adversities; but at Atlas, we refuse to hinder our quality of care to meet this standard. Instead, we stick to our principle that excellence and safety must always come first. Whether you’re stranded in rush hour traffic, or it’s midnight and there’s not a vehicle in sight, our emergency dispatchers are here to answer your call—24 hours a day, 7 days a week. As a vital part of our company’s success, dispatchers ensure that a member of our team is sent to your assistance properly equipped and in a timely manner. In the business for nearly a century, Atlas Towing has proven itself as a firm with the expertise and experience that’s needed to consistently deliver reliable, high-quality services. 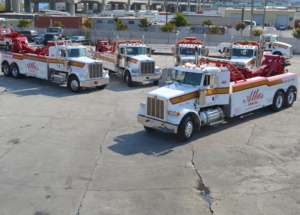 And over the years, we’ve accumulated an assortment of efficiently designed tow trucks, which have contributed to our continual ability to surpass industry standards. Each truck’s distinctive towing capabilities, coupled with our drivers’ precision, makes every tow and recovery secure, while avoiding any potential damage. Our diverse fleet is comprised of heavy-duty, medium-duty, light-duty and flatbed tow trucks—each of which is tailored differently to tow and service an array of vehicles: from tractor-trailers and heavy-duty equipment, to automobiles and motorcycles. We fully understand that every towing and recovery situation is unique, which is why our team utilizes their expertise to personally evaluate every situation. This way, we can ensure that the proper personnel and vehicles are sent to assist our customers’ exclusive needs. When one of your trucks or equipment is out of commission, it negatively impacts your bottom line. At Atlas, we have the right equipment and expertise to get your heavy-duty vehicle back on the road. Our medium-duty tow trucks are exceptionally versatile in their towing capabilities—recovering a wide variety of vehicles, from 1-ton trucks and vans to small bobtails. Whether you’re locked out of your car, having problems with your truck, or need to tow your motorcycle, our team can take care of you and your automobile. In the event that your prized car or truck breaks down and needs to be towed to a service station, a flatbed towing truck can provide greater peace of mind that your car will not sustain any damage while getting towed to safety. Stop fretting over your broken-down vehicle and call Atlas at 800.300.5166 right away. We will be there swiftly, tow your vehicle safely, and reinstate reliability and trustworthiness to your view of the towing industry once again.